Rewire Community is starting a free weekly women's wellness group from March 12, this coming Tuesday. The group will be meeting every Tuesday evening 6:30 -8:00 PM, from March 12- May 21. The aim of the group will be to discuss topics that help build our wellness, lower stress and improve our self care. This is a nurturing space for women to share and decompress. Drop ins are welcome! There is no fee to attend the group. Flyer is attached for more details. To join and for address, please email admin@rewirecommunity.org or call (925) 236-0301. A big thanks to all who joined Rewire Community to celebrate International Women's Day (IWD) on March 10 in San Ramon! 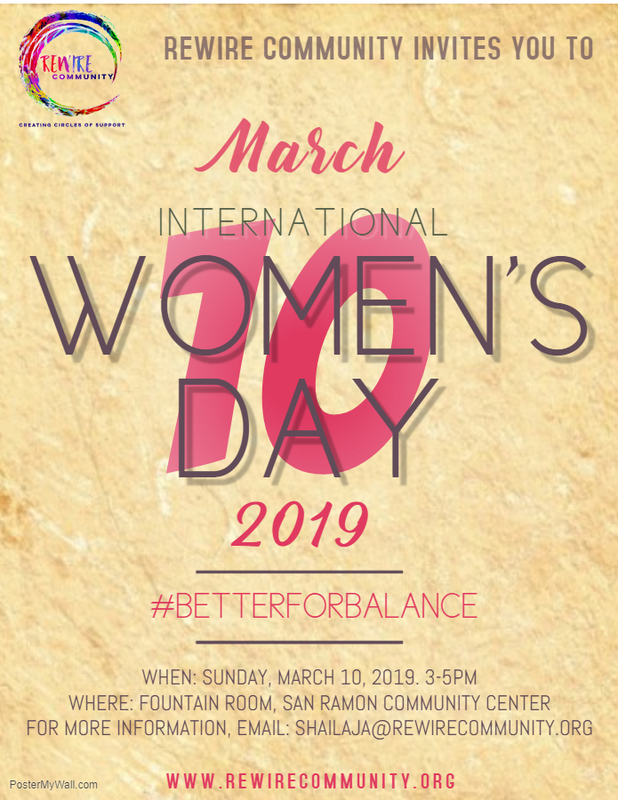 Our theme for the day was 'Better for Balance', with cultural performances by members of our own community speaking to gender balance, social justice, gender fluidity and empowerment. We are grateful for the diverse and inclusive community that came together! A time of thinking, singing, dancing, reflecting and rising together! Rewire Community packed brown bag lunches for homeless shelters in Fremont on two weekends. We were joined by volunteers from the community in San Ramon. The meal bags were delivered that very evening by us to the shelters.